An independent women’s college chartered 1891 as Baptist Female University. Named 1909 for education advocate Thos. Meredith. Campus here since 1926. The educational landscape in North Carolina has evolved continuously since the first school on record opened in 1705. The end of the eighteenth century saw the opening of the first state university at Chapel Hill, in 1795. By tradition most institutions were dedicated to white males. Churches were at the vanguard of instruction for women and blacks, as exemplified by Greensboro College (est. by Methodists in 1838) for women, and St. Augustine’s College (est. by Episcopalians in 1867) for freedmen. At the North Carolina Baptist State Convention in 1835, a member whose name has gone unrecorded suggested that a female seminary “of high order” be considered in North Carolina. A group of four Baptists, led by Thomas Meredith (1795-1850), founding editor of the Biblical Recorder (est. 1833) and charter member of the state convention, regretfully decided to postpone further action until more financial resources were available. It was not until 1889 that Leonidas Polk, an advocate of religious education, echoed the long ignored sentiment and the convention approved the Baptist Female University program in 1891. Eight years later, in 1899, the university, (by then called the Baptist Female Seminary) opened an opulent main hall, designed by A. G. Bauer in the Queen Anne Style on North Blount Street in Raleigh. The first students to cross the threshold graduated in 1901, and were christened the “immortal ten.” In 1909, the university was renamed Meredith College, in recognition of Thomas Meredith, who according to North Carolina historian J. W. Moore, “surpasses all others in importance” within state Baptist history. 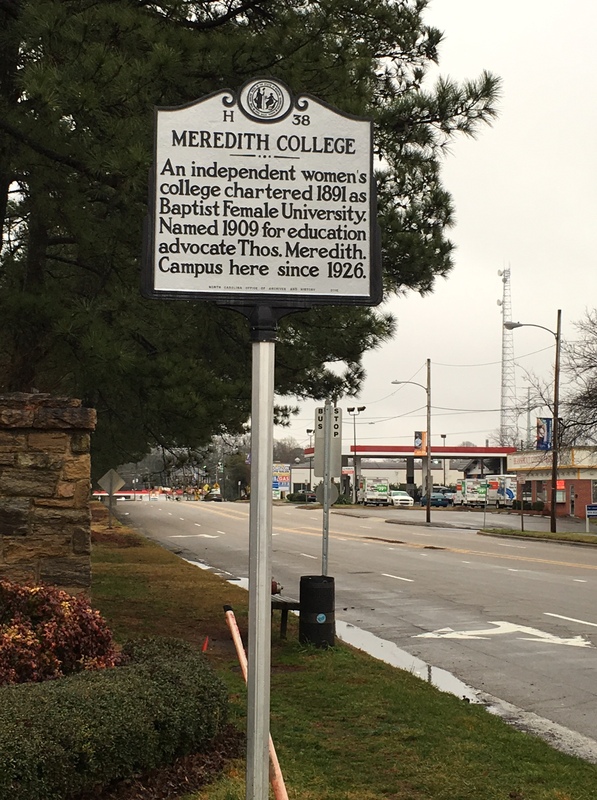 In 1926, Meredith College relocated to its present site at 3800 Hillsborough Street, despite concerns of close proximity to North Carolina State University. Although the institution originally offered a preparatory school from first through sixth grades, by 1918 the college limited degrees to undergraduate. Masters’ degrees were issued in music, education and business studies, beginning in 1983. In early 1997, Meredith trustees removed the college from the Baptist State Convention, citing concerns about academic freedom. In 2000, Maureen Hartford became Meredith’s first female president, a landmark event in the college’s history. 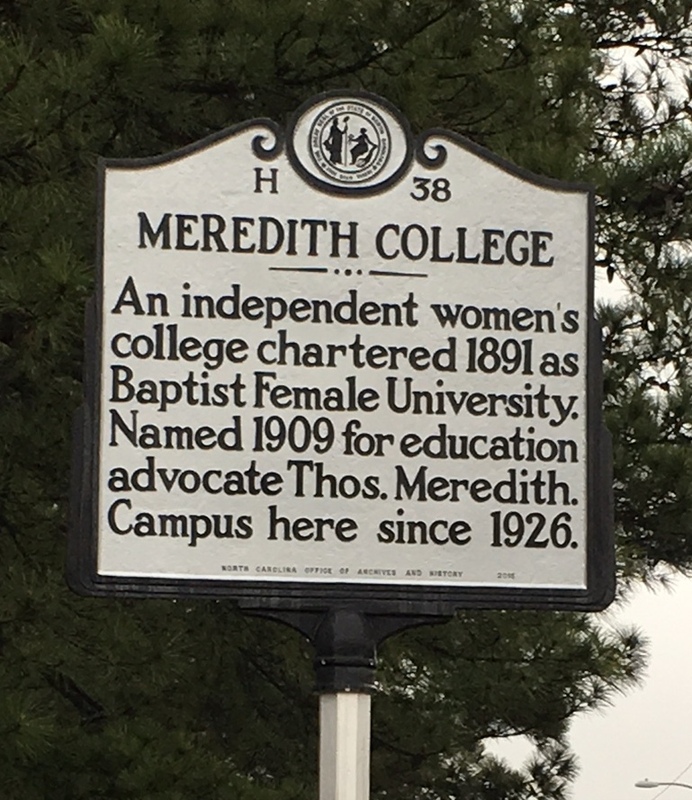 Meredith College is currently the largest private college for women in the Southeast, with majors and concentrations in over sixty areas of study.